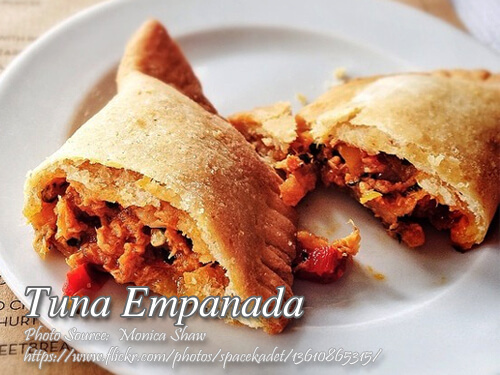 Tuna empanada is one of the many varieties of empanada. Unlike pork, chicken or beef empanada, this is healthier because it uses tuna flakes which most of us know that it has Omega-3 oil that is good for the heart. In this recipe we used canned tuna instead of fresh tuna because it is easier and more suited to making empanadas. The recipe also used an Afritada mix and tuna instead of fresh tomatoes and tuna which is a popular combination of Spanish tuna empanada. To make tuna empanada; Place 1 tablepoonful of the prepared filling at the center of each piece of dough. Fold it forming half moon shape pieces. Twist or flute the edges to seal completely. You can also use a fork and seal the edges by pressing the edges. Arrange them on cookie sheet and brush top with eggwash. Bake at 350°F for about 30 minutes or deep fry until golden brown. In a pan heat oil, sauté garlic and onion for 2 minutes. Add tuna flakes, sauté for 2 minutes. Add the dissolved afritada mix and potatoes. Simmer until sauce thickens. Add the raisins, green peas and grated cheese simmer for 2 minutes. In a large bowl, combine flour, salt, and sugar together. Add the shortening to flour mixture and blend it until the mixture holds together. Continue kneading and add water one tbsp at a time until the mixture turns into a smooth dough then form a into ball. Dust flour into wax paper and place the dough on top and sprinkle with flour. Place another wax paper on top. Using a rolling pin, start with the center of the dough until it reaches to the edges with small rolling strokes until the dough is flattened into ¼ inch thick. Cut out 4 inch diameter circles using a cooking cutter mold on the dough. Place 1 tablepoonful of the prepared filling at the center of each piece of dough. Fold it forming half moon shape pieces. Twist or flute the edges to seal completely. You can also use a fork and seal the edges by pressing the edges. Arrange them on cookie sheet and brush top with eggwash. Bake at 350°F for about 30 minutes or deep fry until golden brown. Makes 10 to 12 pcs.